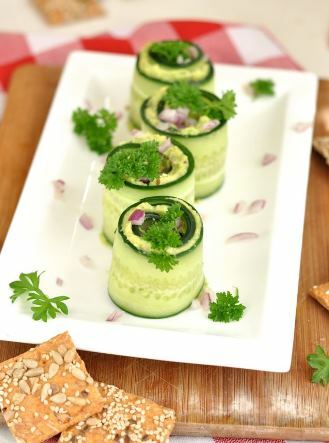 Avocado roll with cucumber - Mehadrin Tnuport Export L.P.
1.Cut the avocado in half and remove the pit. Use a spoon to extract the flesh. Mash it with lemon juice and with salt and pepper. 2. Add 2/3 of the shredded onion to the avocado and mix it together. 3.Cut flat long slices from each cucumber. 4.Put each slice on a plate that is large enough and spread on each slice one teaspoon avocado mixture. There supposed to be some mixture at the edge of the cucumber slices in order for them to stick. 5.Roll each cucumber slice and make it close. 6.Turn the cucumber rolls upright on a nice long plate. Tighten if necessary with toothpicks. 7.Decorate with some sliced green fresh herbs. Also delicious with chicken breast strips or smoked chicken!